This paper describes the disability detection model approaches presented by UPC’s TALP 3 team for the DIANN 2018 shared task. The best of those approaches was ranked in 3rd place for exact-matching of disability detection. The models combine a semi-supervised learning model using CRFs and LSTM with word embedding features with a supervised CRF model for the detection of disabilities and negations respectively. This paper describes the disability detection model approaches presented by UPC’s TALP 3 team for the DIANN 2018 shared task. The best of those approaches was ranked in 3rd place for exact-matching of disability detection. The models combine a semi-supervised learning model using CRFs and LSTM with word embedding features with a supervised CRF model for the detection of disabilities and negations respectively. © 2018 CEUR-WS. All Rights Reserved. 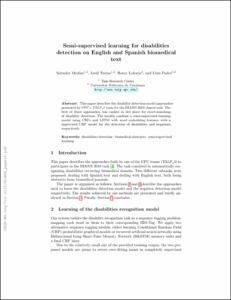 Medina, S., Turmo, J., Loharja, H., Padro, L. Semi-supervised learning for disabilities detection on English and Spanish biomedical text. A: Workshop on Evaluation of Human Language Technologies for Iberian Languages. "CEUR Workshop Proceedings". 2018, p. 66-73.